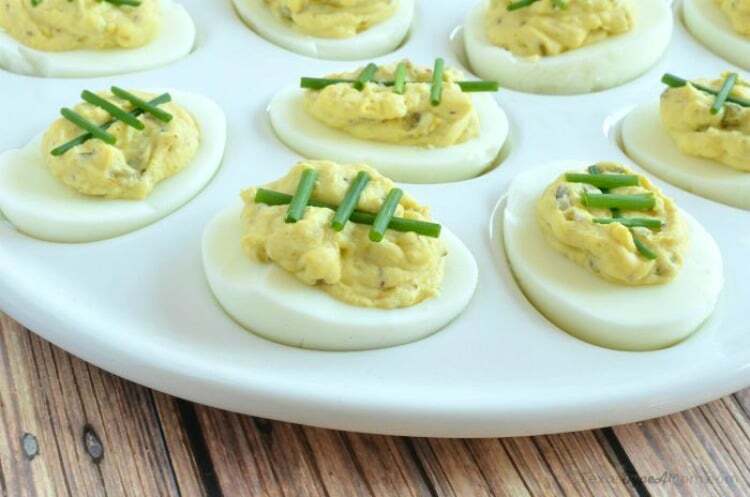 Forget boring appetizers for your next party, try these Spicy Jalapeno Deviled Egg Footballs to make game day special. 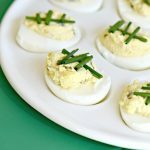 This keto deviled eggs recipe is delicious and one of the best Super Bowl appetizers. Having lived in four other states before Texas, it’s safe to say that no one has pride for their state quite like Texas. It really is a way of life and the culture that accompanies it is so endearing and infectious, you can’t help but want to show your pride. Even if you weren’t born in the Lone Star state, pride for your adopted home abounds. “I wasn’t born in Texas but I got here as fast as I could” is a quote from a popular bumper sticker and for me sums up how I feel about Texas. I may not have been born here or spent the majority of my life here but I love Texas, it’s home, and I’m proud of that. Aside from love of our great state, Texans love football. The next few months will be filled with football games from high school, to college, and on up to the NFL. Even middle school games attract huge crowds and traffic. If it involves football, Texans will watch it. So when game day rolls around (which at this time of year in our area could be Friday-Monday), you’d better believe we’re dining on some tasty food while we’re watching the game. One of my favorite appetizer recipes to make is deviled eggs, but y’all know I like spicy recipes so these aren’t just any deviled eggs…jalapeno deviled eggs. They’re called deviled eggs because in the 1700s, spicy or zesty foods were called deviled. You should boil eggs for deviled eggs for 10 minutes. The recipe starts with assuming you’ve already hard boiled your eggs. Make sure to read How to Cook Deviled Eggs without Vinegar before you get started. It has tons of tips on how to get your eggs to peel easily. Or, you could always make hard boiled eggs in an Instant Pot. There’s 115 calories in two deviled egg halves. How many carbs in deviled eggs? These deviled eggs have less than one carb in a whole egg. The best deviled eggs are good for 3-4 days. However, be careful of allowing eggs to sit on the counter too long without refrigeration to avoid bacteria growth. Is your mouth watering yet? Here’s the full recipe on how to make these spicy deviled eggs. It’s printer-friendly so you’ll have it on hand for your next party! This classic appetizer goes spicy for game day plus a football appearance. Slice eggs in half lengthwise and place yolks in separate bowl. Add mayonnaise, jalapeños, mustard, and salt and pepper to egg yolk bowl and mix until desired consistency. Place filling into a resealable plastic sandwich bag and snip one of the bottom corners. Using the bag, pipe filling into egg whites overfilling slightly. 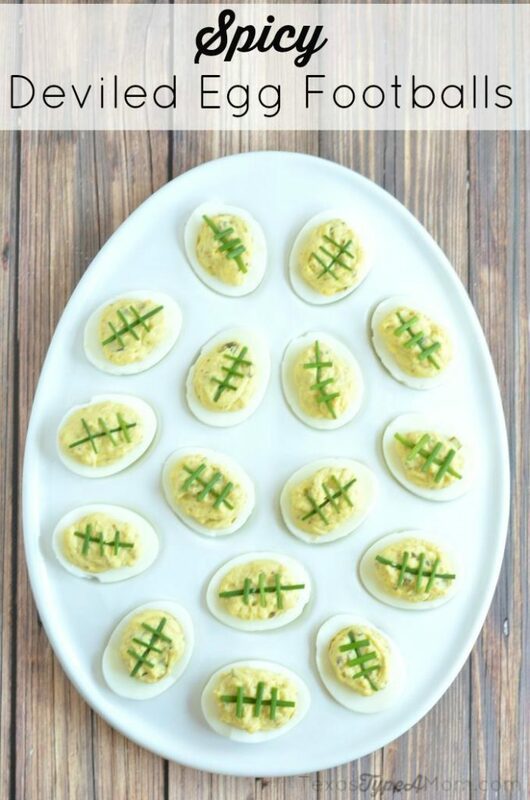 Garnish with one piece of chive lengthwise and three smaller pieces of chive across each egg to create the appearance of football laces. 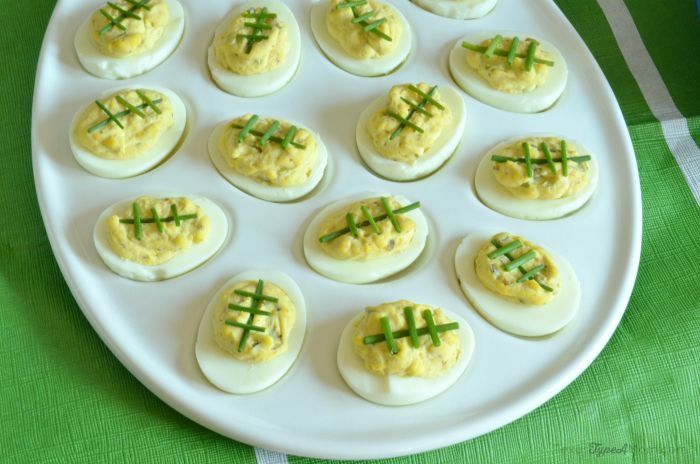 These deviled egg footballs, look best when they’re displayed on a special deviled egg dish. For some inspiration, make sure to check these out. 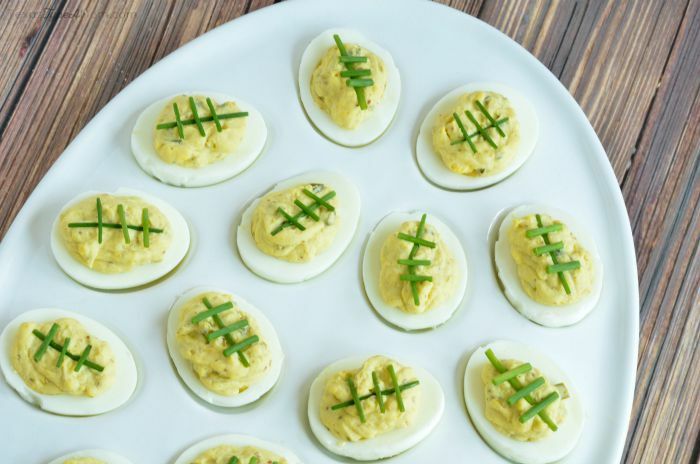 Make sure to pin this deviled egg recipe for game day! If you liked this spicy deviled eggs recipe, make sure to check out this roundup of 30 devilled eggs recipes. These are adorable. They were so tasty and a huge hit at our Super Bowl party! I love all of the extra flavor in this recipe! It really adds a great kick! 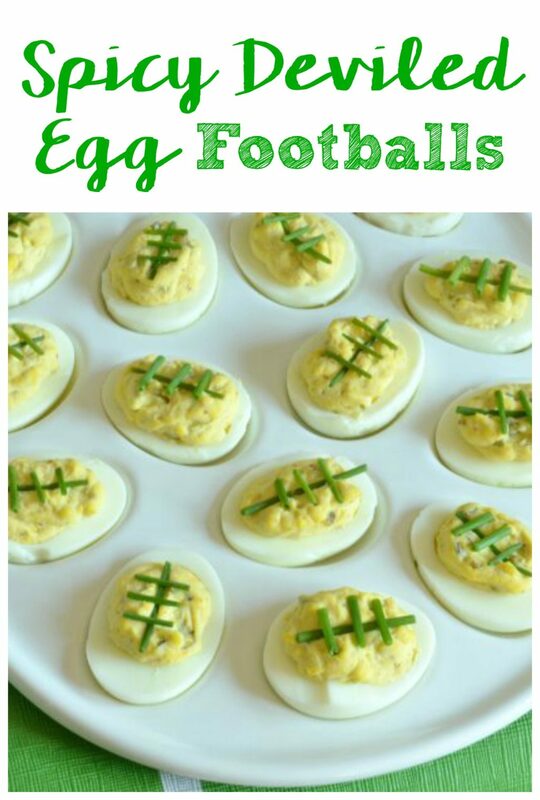 What an easy and delicious app idea for game day! Love it!